Interested in Dual Monitor Winston-E? Winston-E - Empower Higher Thinking. Winston-E is a responsive powered riser that takes the sit-stand conversation to a whole new level. The next-generation retrofit work surface is engineered for ease and freedom of movement. Fully loaded, we’ve thought of every detail for Winston-E so you’re free to think about what’s important to you. Increase productivity with Innovative WNSTE-3 Winston-E triple monitor setup. 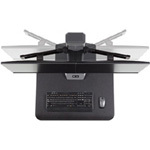 Freestanding base transforms any office into a sit-stand workspace. 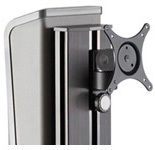 Provides 18" of effortless height adjustment. 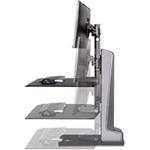 Question: What is the difference between Winston-E and Winston Triple Monitor Sit-Stand Workstations? Answer: The biggest difference is that Winston-E uses an electric motor to raise and lower work surface, while Winston uses a pneumatic, locking cylinder. 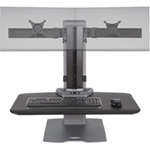 The other advantages of the Winston-E over Winston are a) Winston-E offers focal depth adjustment on the Dual and two of the three monitors on the Triple Workstation. b) Readjusting the location of the monitors on the column is easier on Winston-E. c) Assembly is easier d) Winston-E is programmable to return to the same set height each time.